Life, that is, children, kept me from pâte à choux-ing (gesundheit!) this week. But waffle cone iron cookies baked up crisp and quick, the simple batter requiring no leavener, no resting, and no precooking. 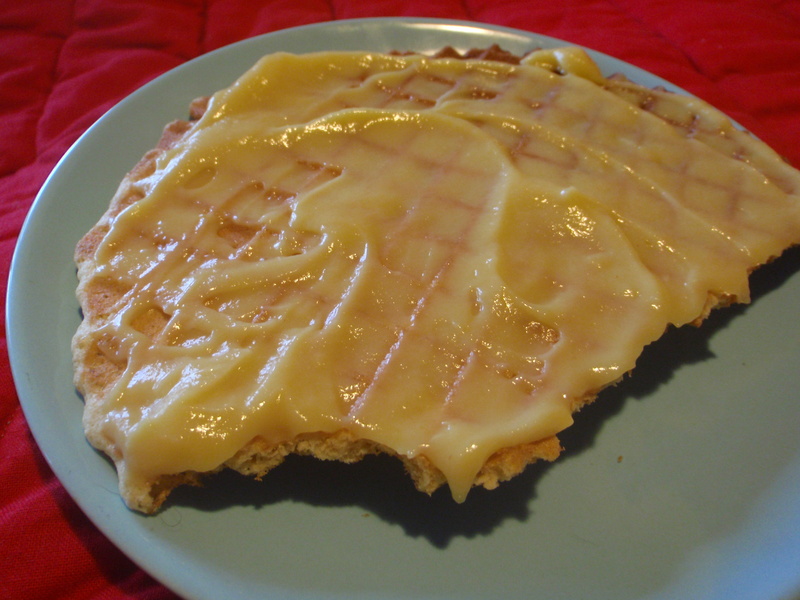 Spread your wafers with pastry cream, stacking them if you wish to construct a Napoleonic dessert. 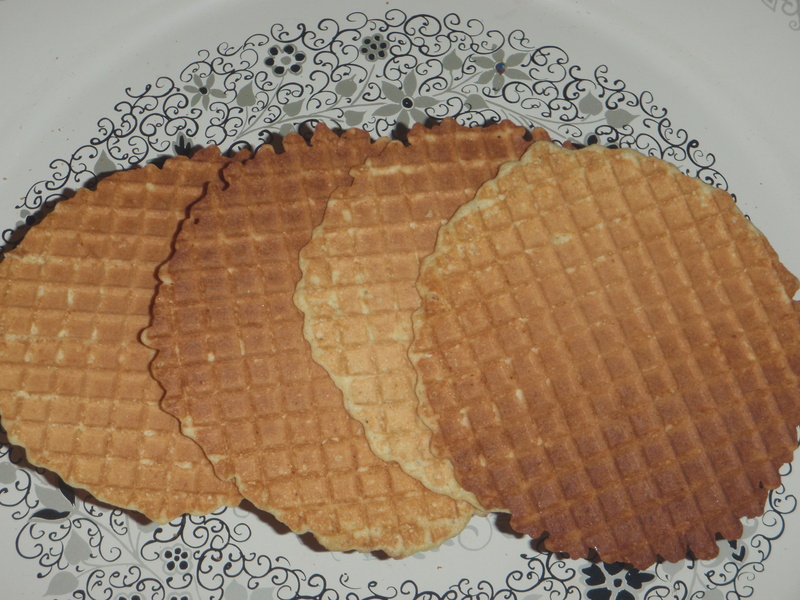 If you don’t have a waffle cone iron (I bought mine at the thrift store, of course, but I think it’s the only one I’ve come across in resale shops), pizzelle irons (I do see these occasionally) and krumkake irons (haven’t found a used one yet) will produce perfectly acceptable wafers just as handily. All this talk of waffle cones and irons reminds me of my friends at Traveling Bistro right here in Austin, Texas. These folks crisp up imaginatively flavored hot waffles every Sunday for their weekly brunches. Check ’em out! 100 grams (½ cup) organic sugar. Central Market sells their own brand for $2.99 for a 2-pound bag. 40 grams organic white whole wheat flour. Whole Foods offers King Arthur brand in the 5-pound bag for the best deal. 40 grams (1/3 cup) organic all-purpose flour. WF 365 brand is usually the least expensive. 2 Tablespoons organic butter, melted and cooled. I love Organic Valley. Click for a coupon. Whisk together the eggs and salt. Whisk in the sugar and flavoring until the eggs lighten in color and consistency. An old-fashioned eggbeater shines here. Whisk in the flours then stir in the butter. Heat up your iron hot. For adjustable irons, try the medium setting first. You’ll have to play around (or read your instruction manual!) to determine the amount of batter required and best cooking time. For my old Toastmaster model, a generous 2 Tablespoon scoop (a spring-loaded scooper helps) and a generous minute of baking produced wafers about 6½” across. Let your cookies cool and crisp on a rack before spreading them with pastry cream (or preserves or creme de marrons or whatever you like). A few words on crème pâtissière. Here’s a basic formula: 1 cup milk, heated to hot, whisked into (combined) ½ cup sugar, 1/8 teaspoon salt and 3 Tablespoons flour. Cook, whisking constantly, over medium-low heat until thickened and smooth, then temper in 2 egg yolks and continue to cook and whisk until the mixture boils. Be sure to boil the pastry cream, as the yolks contain an enzyme that must be deactivated lest your eggs, defiantly deliquescent, reliquefy the cream later. Pour the hot pudding (that’s what we have here!) into a wide bowl and stir in 2 Tablespoons butter and 2 teaspoons vanilla extract. Taste for sweetness and add more sugar if your tooth requires it. Place a sheet of waxed paper directly onto the surface of the crème and cut a few small slits in the paper with a sharp knife. Let cool and refrigerate right away. HEB has got you covered this week with incredible Texas specials: TX green beans 77¢ a pound, TX apples, cameo or fuji, $1.27 a pound, and TX sweet potatoes only 19¢ a pound! HEB’s also selling Central Market Organic corn chips (“fritos”) for $2 a bag. Newflower Market is gettin’ you ready for the holidays with Organic Valley sour cream $2.29 a pint, OV heavy whipping cream $2.49 a pint and Wholly Wholesome organic frozen pie shells, white or whole wheat, $2.49 for a two-pack. Sun Harvest is offering OV heavy cream for $2.50 a pint and Sprouts kicks in with WW pie shells $2.50 per two-pack. Whole Foods has OV heavy cream for $3, minus your Whole Deal coupon (75¢), you’ll get the pint for $2.25. And WF has brought in organic pineapples from Costa Rica for $2.99 each. So bake up a few Texas sweet potatoes to throw (hot or cold) into the bowl as you mash your russets next week. And simmer up some “Hominy au Gratin” with your OV heavy cream: Drain 2 15½ ounce cans of hominy (I like to use one can of white and one can of yellow). Combine hominy and one pint Organic Valley heavy cream in a heavy medium-large saucepan (about a 3-quart pot) and bring to a boil over medium-high heat. Reduce heat a bit and let boil a few minutes, stirring occasionally, until cream reduces to a medium saucy consistency. Remove from heat and stir in 8 ounces of Full Quiver Farm’s cheddar cheese, shredded (buy the sharp if they have any). Season with salt and pepper, et voilà! This week’s Central Market coupon (expires June 28) gets you $5 off any produce when you spend $40 total at the store. That’s just right for picking up a 1 pound bag–at $4.99 each–of fresh blackeyed peas or purple hull peas (or cream peas or pinto beans when they show up) from Oak Hill Farms in Poteet, Texas. 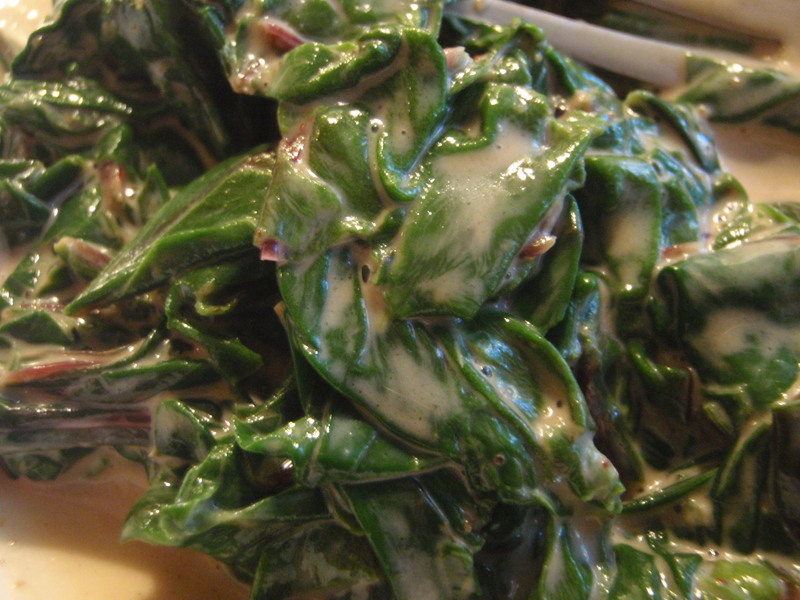 These are the same folks that bring us that wonderful triple washed spinach in the cooler months. Fresh peas and beans couldn’t be easier to cook–no soaking required. I like to cook them in broth made with a ham bone or Whole Foods very smoky ham hocks (from humanely raised pigs). You can make broth ahead and freeze it but it only takes 20 minutes to cook up in the pressure cooker. Of course you save time and energy by cooking the beans and pig parts together. Whatever suits your schedule. I employ the usual cast of characters when fixin’ a pot of peas: onion, bell pepper–Finca Pura Vida at Sunset Valley Farmers Market grows the most delicious California Wonders, red or green–garlic, thyme (try to grow your own), bay leaf, parsley or celery if you have some and a healthy shot of vinegar towards the end. Fresh field peas take about 40 minutes or so to cook up. I usually just cook them in a pot on the stove, regular style (no pressure cooker or slow cooker). Salt them in the beginning if your broth isn’t robustly seasoned and add the spicy peppers of your choice then as well if you don’t have to coddle tender young palates. Otherwise embellish your own bowl as desired. Finally someone’s come out with organic Frito® style corn chips! Can you tell I’m excited? I’ve been waiting for this product for years and Central Market has delivered the goods in both yellow and blue corn varieties. At $2.29 per 8 ounce bag, most any non-cook can feed the family a fast, super easy and fun Frito® pie meal. We used Amy’s organic canned vegetarian chili–our favorite is the medium black bean and we also enjoy the southwestern black bean. It usually goes for $2.99 a can but more than once I’ve found it on sale at Whole Foods for $2.69–a good price for stocking up for a road trip ’cause it makes nutritious and tasty survival food. Do we even need a recipe? Put some corn chips in a bowl. Heat up your chili. Plop some onto your chips. Top it off with shredded cheese–we like Full Quiver Farms cheddar (Sunset Valley Farmers Market) and Brazos Valley (Austin Farmers Market) offers several compatible flavors. Sophisticate it with chopped onion–plenty of 1015’s, organic reds and green onions are available right now–and spice it with chopped chiles, if you have time. Now kick back and gobble like you’re hangin’ at the state fair! We survived our two week long road trip. Along the way we visited some farmers markets in Oklahoma and Tennessee to take advantage of local butter, yogurt, pecans, strawberries, blackberries, plumcots and raspberries. Great fun but I must admit and warn that even with the best intentions soft fruits don’t travel well. Eat them up quick! A welcome advancement in grocery shopping is the increasing availability of locally grown and locally produced products in supermarkets. This past week at the Whole Foods in Atlanta we found Logan Turnpike Mill stone ground white cornmeal and yellow cornmeal. This family run business grinds Georgia grown whole grain corn on an antique grist mill. To my profound disappointment the store was sold out of the grits but I ‘spose I’ll get by. Other treats we gobbled up were Sweet Grass Dairy’s Thomasville Tomme and Sevenwood cheeses. Another family run operation, Sweet Grass Dairy produces a dozen or so different cow and goat milk cheeses. Lucky for us WF sells these two raw cow’s milk cheeses and a chevre. Back in Austin, visiting our hometown WF we discovered plenty of local produce, some on sale. Organic Texas blueberries ($2.99 per 1/2 pint), Texas blackberries ($3.99 a pack), fragrant Texas grown white nectarines ($2.99 a pound), organic Texas zucchini and yellow squash ($1.49 a pound) and toothsome Fredericksburg bi-color corn (2 for $1). This week Newflower Market is offering Texas peaches (2# for $3), seedless Texas watermelons (2 for $5) and Texas cantaloupes (2 for $3). So if you can’t make it to the farmers market tomorrow you’ll still find plenty of options when going for Texas produce.